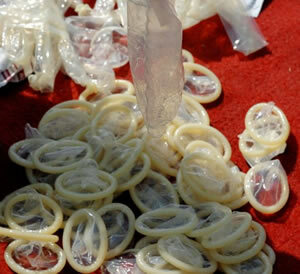 The Zambia Compulsory Standards Agency has seized 80 packets of rubber condoms in Livingstone city. This was done in an effort to ensure that there is safety and quality on the compulsory standard products. “On the 26th June, 2018, ZCSA Office in Livingstone received a phone call from an unidentified customer to an effect that he had purchased expired condoms from Stop Shop situated in the 217 area in Livingstone District of the Southern Province of the Republic of Zambia. Without any delay, the ZCSA inspectors swung into action and conducted an on-spot inspection,” said Agency Spokesman Lee Hamunji. “After conducting a thorough check, it was indeed established that there were some expired condoms namely, 8 packets of Contempo hot condoms valued at K160.00 expiry date October 2017. 72 packets of Contempt endurance condoms valued at K1, 728.00 whose expiry date was April 2018”. Mr Hamunji said some of the parameters that are used to test for condoms include thickness of the condom, length and width of the condom, water leakages, bursting volumes and pressure and also freedom from holes and visible defects. Meanwhile, the shop mentioned in this matter is allowed to continue unpunished? Without any punishment after some Users could have been infected? Expired condoms are readily available in government hospitals and clinics if the zambia standards people want more than what they have already picked for their personal use. Rubber condoms? All condoms are made from rubber. The headline insinuates some condoms are made out of other things. Like paper or iron maybe?